A full national exhibition will be held in Perth to coincide with the Scottish Congress for the first time since 2012, and we expect to have at least 120 frames. Exhibits can be entered in all classes recognised by the ABPS and all exhibitors from the UK and abroad are welcome to apply. 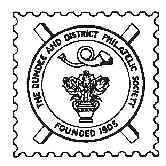 The Royal Philatelic Society London is the oldest surviving philatelic society in the world and will celebrate its 150th anniversary in 2019. To mark the occasion it is organising a display of up to 30 frames on the theme of ‘King George V’. As first Duke of York and then Prince of Wales, King George V was President of the Society from 1896-1910. This will also be the final opportunity in the UK to qualify for London 2020. 29 May -2 June 2019 Stockholmia 2019 This will also be the 150th Anniversaty of the Royal Philatelic Society London. Participation is open to all Fellows and Members of the RPSL. The exhibition will comprise non-competitive (display) and competitive classes. There will be approximately 2,000 frames (faces). Closing date for applications is 30th April 2018 and applications should be sent to the Commissioner General, Jan Berg. Venue: Waterfront Congress Centre, Nils Ericsons Plan 4, Stockholm. 2-9 May 2020 London 2020 Deadline for applications is around the End of February 2019. This page was last modified on 16th February 2019.